This outdoor swing with a head cover is suitable for a family use on your porch. Made up of durable metal frame and soft seating, you can easily adjust this seating swing into a comfortable lying bed. Read the best hammocks review here.. The comfortable seating and durable metal frame of this swing ensures that this swing guarantees a long term use. Other eye catching points are its adjustable seat position and stylish design. Build and construction: The skeleton of the swing is a solid steel frame which has been given curves to enhance its look and make it look bold. The sand colored covers of the cushion and the shade are made of outdoor rated sand- hued polyester fabric. The shade above the swing protects from harmful UV rays and lest you enjoy a cool sunny afternoon. Weight capacity: Holding up to a weight of 750 lbs, the dimensions of this swing frame are 75″ w x 44″ d x 65″ h. A family of three can be seated comfortably on this swing. 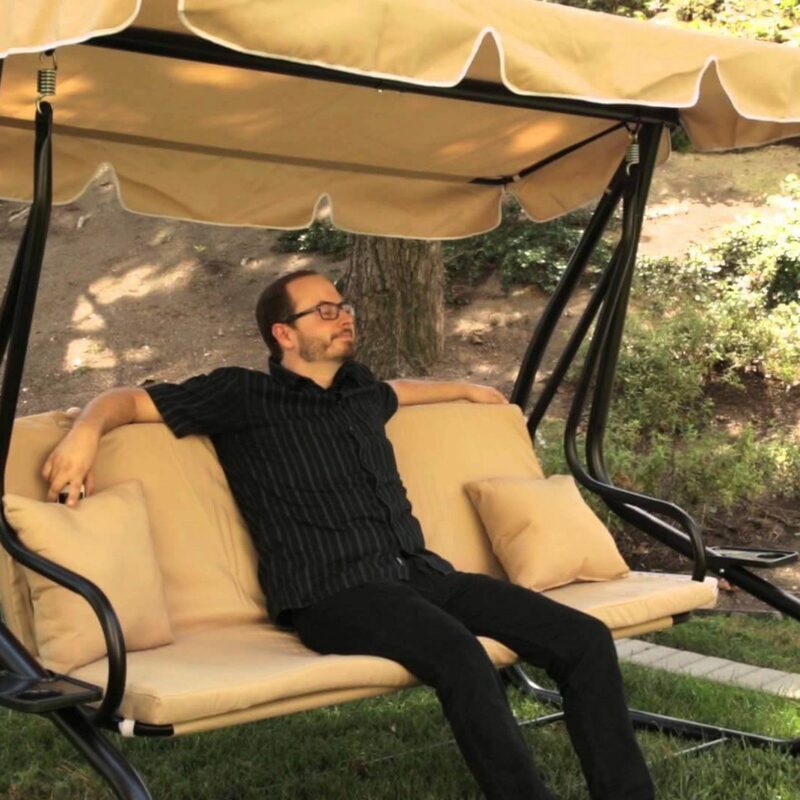 Comfort: You can easily convert this seated swing into a bed with a simple action. The converted bed is extremely comfortable and provides for a relaxing nap. You can lie down on the bed while it is securely locked in a firm position. It also has a container holder attached at the side for complete convenience. The soft cushioned seating is extremely comfortable to sit on or lie down. The polyester fabric feels great on the skin as well. Durability: The solid steel frame provides enough durability and longetivity to the swing. It keeps it in place while providing the required strength. The curved yet stable ends of the swing provide proper stability and keep the swing fixed to the ground. With comfortable seating, seat- to- bed- conversion and an impeccable design, this swing provides great relaxation to a family of three, carrying a heavy load of 750 lbs. 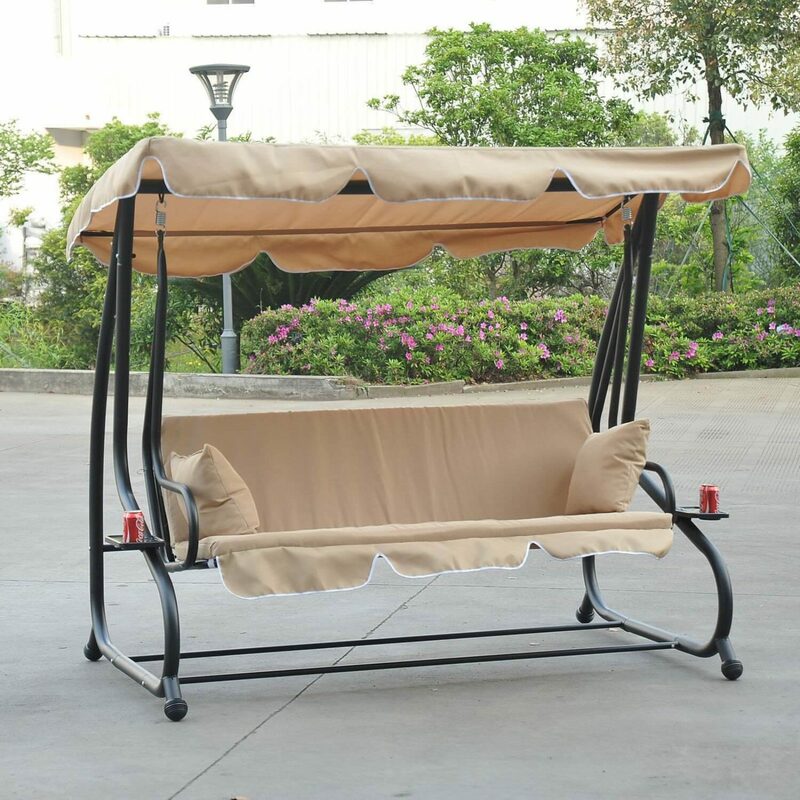 The durable steel frame and soft fabric are other factors to consider this swing as a good buying option. 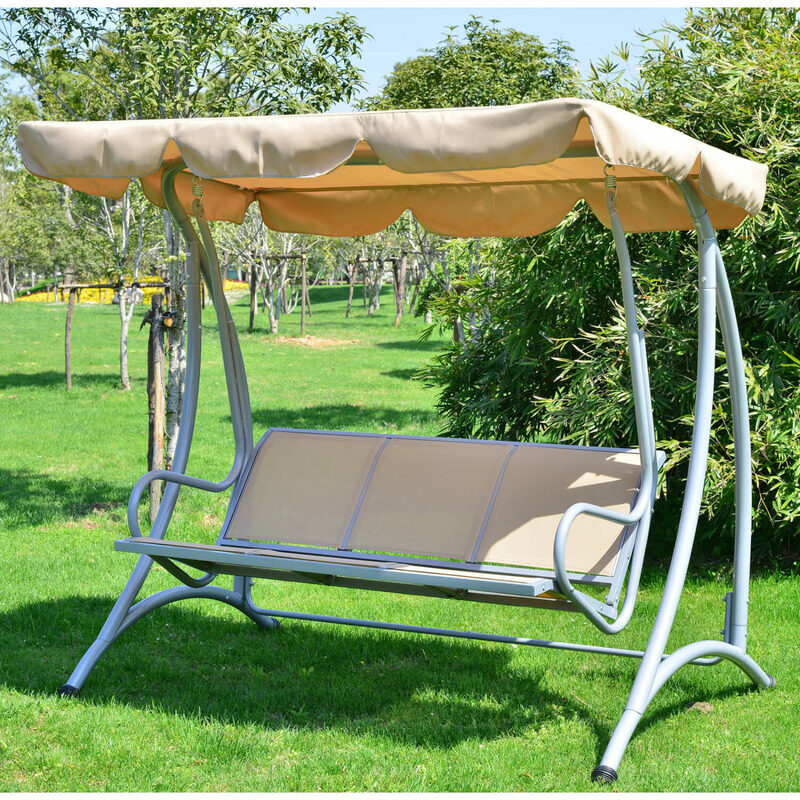 Plus, the swing provides protection from harmful UV rays through the overhead shade in its design.